A (long) while ago I presented you the Easy-phi project, which aims at building a simple, cheap but intelligent rack-based open hardware/software platform for hobbyists. With this project, you simply have a rack to which you add cards (like the one shown above) that perform the functions you want. During these last months my team has been finishing the design and production of several different boards so I’ll start showing them off during these next weeks. 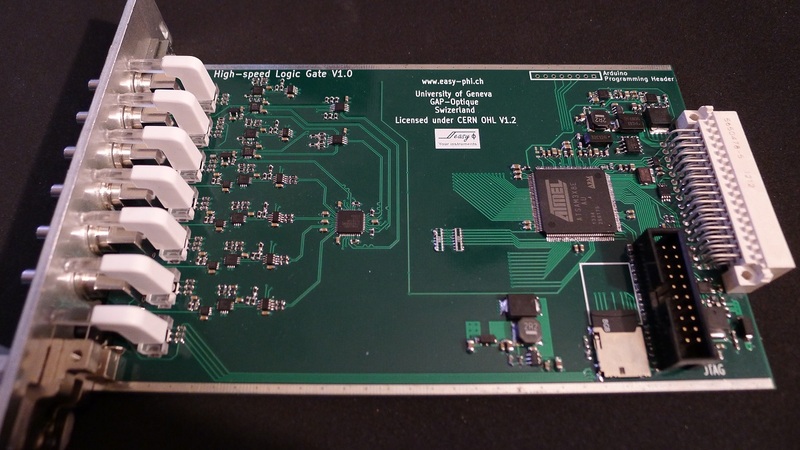 Today I present you the High Speed Logic Gate Board, a quantum-physicist requested easy-phi module that can perform logic AND/OR functions at <2GHz speeds. This quite technical write-up is mainly about the constraints that high-speed signals pose for schematics design but is also about the techniques that are used for HS signals termination and monitoring. I hope, however, it’ll give our readers a nice overview of what the insides of a high-speed system may look like. All the files used for this board may be found on the official GitHub repository. [David’s] been making robots since he was 16. After conquering the basics, he wanted to build something a bit more interesting than a simple wheeled-robot — he wanted to buy a hexapod but they were too expensive — so he decided to design his own low-cost version! It’s made out of hand-cut wood, SG90 servos, an Arduino and a 16-channel servo controller. A 2.4GHz remote control sends commands to the Arduino which then communicates to the USC servo controller, allowing for intricate control of the 14 servos that make up the HexDrake. He’s also added a few LED arrays for the eyes of his robot, which in the future will be animated to give expression to his little hexapod. It’s an extremely well built little bot, and [David’s] made a very in-depth Instructable for anyone who would like to follow in his footsteps. Stick around after the break to see it scurry around! Elecrolumiscent displays have seen a huge swing in popularity recently, but only in limited forms like EL wire or flat EL panels. You can, of course, cut and bend these wires and panels to suit any purpose, but custom shaped EL displays are just the bee’s knees. They’re not hard to fabricate, either: with cheap custom PCBs, all it takes to make custom EL panels is just a few chemicals. 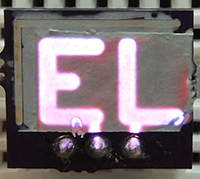 [Nick]’s method of fabricating custom EL displays uses an exposed copper layer on a PCB you’d pick up from OSHpark or any of the random board houses in China. The process consists of designing a display – be it a few letters, pixels, or a seven-segment arrangement. The display ‘stack’ is a layer of painted-on dialectric, a phospor, and finally a translucent conductive ink that connects the display segments to ground. It looks like an extremely easy process, and from the pictures it looks like [Nick] is making some EL displays of reasonable quality. [Nick]’s work was inspired by the grand poobah of homebrew electrolumiscent displays, [Jeri Ellsworth], who managed to make a similar EL pixel on a PCB. [Nick]’s display looks great, though, and with a little work some custom segment displays should be very possible. [Zenta’s] sphere morphing hexabot, the MorpHex, continues to impress us. He’s just released a video showing it off — by having it roll down a hill! We’ve been following the MorpHex since 2011, and it really is an amazing project — especially when it started to roll around on its own! In this latest update, [Zenta] was trying to get a good outdoor test video, as he’s never seen a hexapod robot roll down a hill. The video (and rolling) goes smoothly until about 3 minutes 36 seconds in, when the MorpHex experiences a catastrophic inner body servo failure! Surprisingly, it didn’t fail during its tumble down the hill, but when it was just walking around afterwards. [Zenta] attributes it to a poor quality servo and had bad feelings about it breaking previously. Not fixing it earlier resulted in having to spend 10 hours of his Easter holiday taking Morphex apart and repairing it! Just goes to show… don’t wait until it’s too late to fix something! Sometimes you have to bust out the wayback machine to find a good hack. 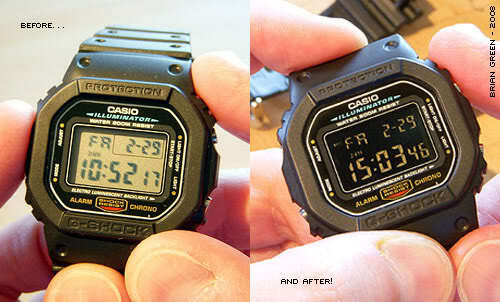 Back in 2008, [Brian] performed this awesome negative display hack on his classic Casio G-Shock watch. The G-Shock, like most digital watches, uses a twisted nematic LCD. All Liquid Crystal Displays are made up of a layer cake of polarizers, glass, and liquid crystal. In non touchscreen displays, the top layer is a sheet of polarizing film glued down with an optical quality adhesive. [Brian] disassembled his watch to reveal the LCD panel. Removing the glued down polarizing film can be a difficult task. Pull too hard and the thin glass layers will crack, rendering the display useless. After some patient work with an X-acto knife [Brian] was able to remove the film. Much like the privacy monitor hack, the naked watch appeared to be off. Holding a sheet of linear polarizing film between the watch and the viewer reveals the time. If the film is rotated 90 degrees, the entire screen is color inverted. [Brian] liked the aesthetics of the inverted screen, so he glued down his polarizing film in the offset position. After reassembly, [Brian’s] “customized” watch was ready to wear. How does one go about measuring the amount of light in a given area? With a Light Meter of course! Maintaining proper lighting levels can be very important in places like schools, hospitals and even your own workbench. [Raj] over at Embedded Labs has put together an excellent tutorial on how to construct your very own light meter based upon the chipKIT platform. The chipKIT Uno32 is similar to Arduino, but boasts a much more powerful PIC32MX320F128 microcontroller. We’ve seen projects that feature the chipKIT Uno (pdf warning) here before. From playing pong to hosting several temperature sensors, it’s certainly a versatile platform. The light meter uses an I/O shield and communicates to a BH1750FVI digital light sensor via I2C. 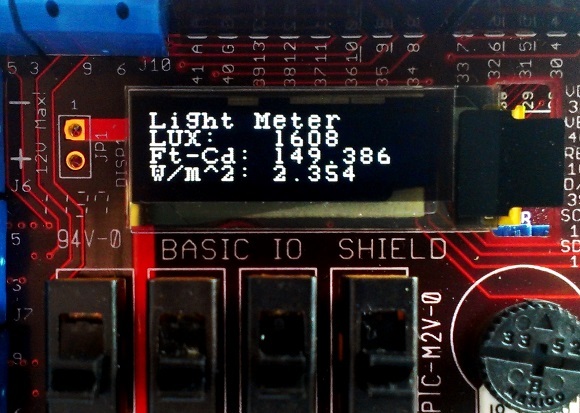 The firmware divides the raw data coming off the sensor by a constant, and displays the light intensity data on an OLED display in Lux, foot-candles, and Watts/m^2 units. Be sure to check out the tutorial for full schematics and source. Ah yes, how could we miss Star Trek? To be honest, we’re surprised there aren’t more entries of Star Trek related projects in our Sci-Fi Contest! There’s actually no info on this project yet, but we have to admit — it’s a pretty cool (albeit nerdy) concept. They want to fit a Bluetooth headset with a loudspeaker into a Star Fleet Communicator Badge, activated by tapping on it gently. This ones a really cool hack. A team of four have taken a 1978 Bally Star Trek Pinball machine, and converted it into a Star Trek Mirror Universe Pinball machine based on the TOS episode Mirror, Mirror where Kirk and his crew are transported to a parallel (mirrored) universe! The JJ Tricorder, named after its team [Julia] and [Jaromir] is planned out to look just like the SR-580 type Tricorder — except its going to be backed with 21st century technology. The main goal of the project is to have it be able to detect and analyse electromagnetic, geographic and environmental parameters. There’s lots of inspiration for it, like the now-open-source Berkeley Tricorder or the Tricorder Project itself! Still haven’t entered the contest? Don’t worry — there’s still time for you to put an awesome Sci-Fi project together to win some crazy cool prizes! It just needs to be done and documented by April 29, 2014!